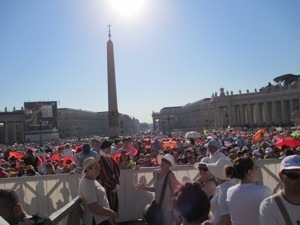 So out the porta by 6:30, grabbed a delicious Italian breakfast and a taxi to Piazza San Pietro. By 7:00 am quite a crowd was forming, they shuffled us through a few barricades, and by 8:00ish, I was in the front seating area….without a seat. At that point, I watched as people there for Holy experience acted….pretty unholy. My philosophy was that part of this adventure was for me to work on being more patient, so I just stood near an area with lots of seats (reserved for large groups from different parishes) thinking that I might get lucky. I figured if I did not, I was there in the right frame of mind and heart and He would know that. The people watching was…I do not even have words. 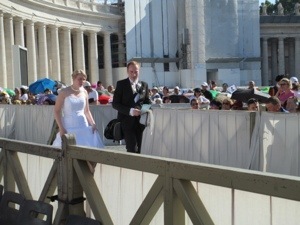 Several newlyweds came presumably right from their ceremonies. Old, young, really old…really young and every age inbetween. The troop of “ladybugs” were so like something right out of a movie. See…my forced patience benefited me! The shouts of “Papa! Papa!” were something I will never forget. 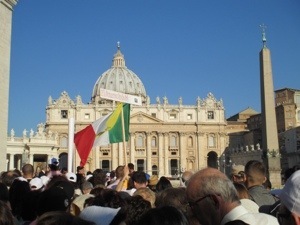 He stopped his “Pope Mobile” right in front of me and kissed babies raised over the barrier for his precious blessing. 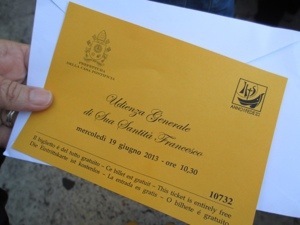 At the end of the audience, the same woman turned to me and gave me a Pope Francesco prayer card. Although I had just purchased several and they are now blessed, the one from her will be my favorite. Enjoying everything you reported so far. Times have changed. In 1977 no ticket was needed and little security. We saw Pope Paul VI inside the Vatican church where he was carried by 6 large men on a platform around while giving us his blessing. I got a great picture of him. The church was filled with children dressed for first communion. 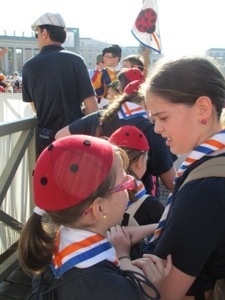 You are making memories that will last a lifetime and thanks for reminding me of my time with a papal father. You are doing great kid. Keep enjoying everyday. It is truly an expericence that I will never forget and I am Methodist. What a blessing for you, Paige. So enjoying your posts! Living thru you my friend!! And I got goosies when I saw the pic of the Pope! Wow. I’ll check in again soon! How exciting! 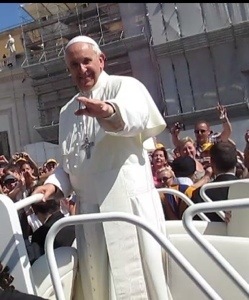 The only thing my sweet daddy asked me to do when Jim and I went to Rome was to, “Tell Papa, hello.” Well, when we had the unexpected pleasure of seeing the Pope six feet in front of us, I impulsively started running alongside the Pope Mobile and screaming, “My daddy said hello. 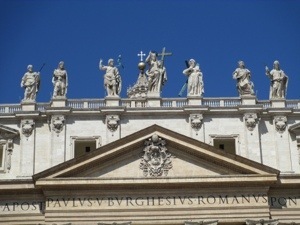 My daddy said hello.” I am surprised the Swiss Guard didn’t pick me up right then and there!